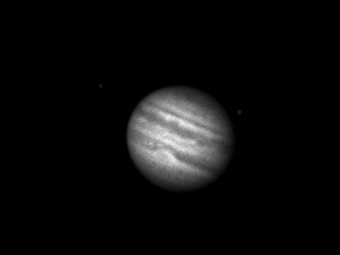 Jupiter showing off the Great Red Spot. Seeing conditions were moderate with wind gusts and clouds from time to time. 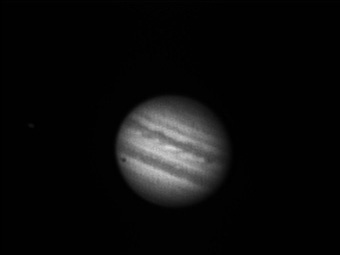 Two Jupiter moons are visible - Io is upper left and Ganymede upper right. Eyepiece projection, focal length 9.9 meters (F:49). Cookbook CCD camera. Resolution: 252 x 242. Exposure time: 0.1 sec. 8 frame stack. The shadow of Europa can be seen in the lower left part of the planet. Seeing conditions were moderate. Eyepiece projection, focal length 9.9 meters (F:49). Cookbook CCD camera. Resolution: 252 x 242. Exposure time: 0.2 sec. 4 frame stack.